A captured Islamic State militant who spoke to Sputnik news agency has bolstered claims that Turkey is involved in illegal oil deals with the jihadist group up to the hilt. 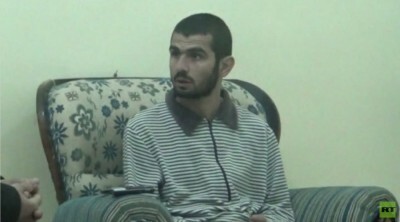 24-year-old Mahmud Ghazi Tatar (pictured left, photo credit: RT) says he joined Islamic State (IS, previously ISIS/ISIL) from the Turkish city of Adiyaman. Together with other recruits, he was transported over the border into Syria where he received terrorist training. RT obtained interview footage with the captive from Sputnik news agency. In it, the former IS fighter reveals details about Turkey’s alleged oil links to the terror group. ISIS’s black market oil trade has come under scrutiny from the international community amid turbulent oil prices, which have fallen to half their previous level in 2015. Crude oil extracted at Syria’s Deir ez-Zor and Iraq’s Qayyara oil fields, which remain under under Islamic State control, is being sold for as little as $25 per barrel to smugglers, independent Syrian and Iraqi traders who transport oil using their own trucks. “Turkey is playing not a very clean game, especially with smuggling the Iraqi oil and Syrian oil through the borders and selling it in the black market in Turkey,” Iraqi MP Mowaffak Al-Rubaie, a former national security adviser, told RT, adding that a recent investigation by the Norwegian authorities exposed Turkey as having ties with Islamic State’s illegal oil trade. A political science assistant professor from the Northeastern University in Boston, Max Abrahms, told RT that it is exactly the illegal oil trade that has enabled Islamic State to become so strong after seizing vast territories in Iraq and Syria. “Islamic State is one of the most powerful – I would say the most powerful – terrorist group that we’ve ever seen,” Abrahms told RT, explaining that the group’s wealth fuels its ambitions. “Over 50 percent of Islamic State’s money has come, historically, from oil. Estimates are between $40 million to $50 million of profit [a month] just from oil alone,” Abrahms said.